Dubai: one of the worlds most talked about glitzy, glamorous, over-the-top cities, teeming with excess and a truly addictive sense of flamboyancy. It is also without a doubt, one of the most ideally located cities on the planet with most worldwide destinations less than an 8 hours flight away. But Dubai holidays have more to offer than just an ideal location or VIP glamour and shopping. Visitors and locals alike can enjoy the diverse scenery and surprising beauty of this desert city, its rugged mountains, stunning sand dunes and relaxing beaches, beautiful green parks, dusty villages and ancient homes. Not to mention the bustling city centre full of luxurious apartments and awe-inspiring sky scrapers reaching toward the stars. The city is host to a world renowned shopping festival and dazzling entertainment. No matter your reason for visiting this glorious city, be it materialistic pleasure, or a peaceful escape from the norm, sipping cocktails under the night sky and letting months of stress drift away from your newly sun-kissed shoulders, Dubai truly has something for everyone… even endangered species of turtles! Over the past few years, many endangered young sea turtles have found themselves unexpectedly washed up onto the white shores of beautiful Jumeirah, one of the most exclusive areas in Dubai. Without help, these turtles would be left to die. Thankfully, Jumeirah’s residents jumped into action. The area is now home to the Dubai Turtle Rehabilitation Project rescuing hundreds of sea turtles each year. Deep in the bowels of the luxurious and popular Burj Al Arab Resort is a complex maze of saltwater tanks and aquariums home to distressed, injured and endangered sea turtles, which have been rescued from the shores of Jumeirah beach. Many of these beautiful creatures have been found stranded on the sand, dying from a multitude of illnesses and ailments. A few years ago, local wildlife preservationists and veterinary specialists decided to take action. Since 2004, the project has been taking in sick and injured turtles from around the Gulf area to rehabilitate them for release back into the wild. 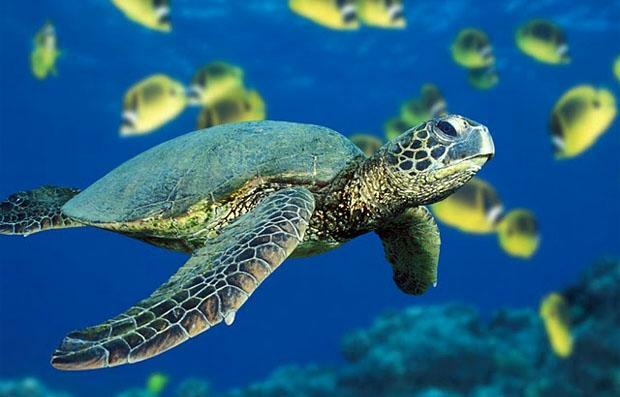 Thanks to greater awareness and facilities, many turtles are now being saved each year. As of March, 2011 more than 210 sea turtles were being treated in the Dubai rehabilitation centre. The majority of critically endangered sea turtles currently being rescued are juvenile Hawksbill turtles, which have declined by 97% in the last three generations. Many green sea turtles are also being treated. The Burj Al Arab resort invites visitors to see the sea turtles swimming in an array of beautiful aquariums. Visitors can enjoy seeing many of these beautiful sea turtles in their final stages of recovery as they happily swim about in a private enclosure, part of the resort’s waterways, and regain their strength in preparation to return to the ocean. Visitors are invited to watch the turtles swimming and feeding in the many multi-level viewing areas and learn more about the turtles from the resident experts. Dubai is very proud to be host to this amazing program, helping to prevent the extinction of these many amazing turtles. For lovers of marine life, it is a real treat to see these beautiful endangered creatures up close. If you’re lucky, maybe you will even get to see some released into the wild! This is a guest post by K Newey. She has always been fond of saving sea turtles and even took care of a few when she was younger. She definitely recommends Dubai Holidays and hopes one day she’ll get to visit the Dubai Turtle Rehabilitation Project.